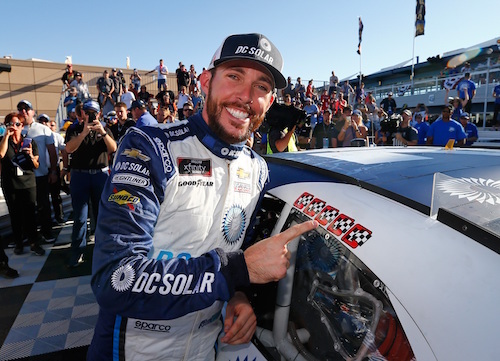 Ross Chastain will compete full-time in the NASCAR Xfinity Series in 2019, combining rides with two teams. He will drive the No. 4 JD Motorsports Chevrolet for 30 of the 33 races that make up the 2019 season and drive the No. 10 Kaulig Racing Chevrolet in the other three races. Chastain drove the No. 4 in all but three Xfinity Series races last season but drove the No. 42 Chip Ganassi Racing Chevrolet in races at Darlington (S.C.) Raceway, Las Vegas Motor Speedway and Richmond (Va.) Raceway. He collected his first and only series win, to this point, in the Las Vegas race. Chastain left JDM at the end of the 2018 season for a full-time opportunity to drive the No. 42 CGR car, but Ganassi has since shuttered operation of its Xfinity Series program after legal issues for primary sponsor DC Solar. Blake Koch was expected to drive the No. 4 JD Motorsports entry in 2019 after not racing in 2018 as a result of losing his ride with Kaulig Racing at the end of the 2017 season. Koch, though, has opted to concentrate his focus on his company, Filter Time. Chastain’s three races with Kaulig Racing this season will be the season-opening race at Daytona (Fla.) International Speedway on Feb. 16, Chicagoland Speedway on June 29 and Texas Motor Speedway on Nov. 2. Justin Haley will be Kaulig Racing’s full-time driver behind the wheel of the No. 11 Chevrolet.